Day 1: Lhasa arrival. 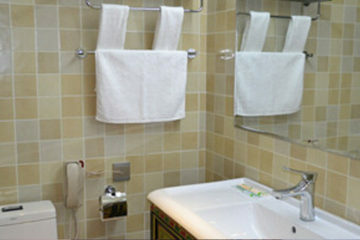 Pick up and transfer to your hotel. Overnight in Lhasa. Day 2: Lhasa sightseeing: Jokhang Temple, Barkhor Streets, Sera Monastery. Overnight in Lhasa. Day 3: Lhasa highlights: Potala Palace, Norbulingka Palace. Overnight in Lhasa. Day 4: Lhasa – Shigatse (350km). Lake Yamdroktso, Karola Glacier, Pelkor Chode Monastery and Kumbum Stupa. Overnight in Shigatse. Day 5: Shigatse – New Tingri (200km). Visit Sakya Monastery. Overnight in New Tingri. Day 6: New Tingri – Everest North Base Camp (120km). Rongbuk Monastery, Everest Base Camp. Overnight at campsite or local guesthouse. Day 7: Everest Base Camp – Saga (330km). Views of Mt. Shishapangma and Peikutso lake. Overnight in Saga. Day 8: Saga – Lake Manasarovar (500km). 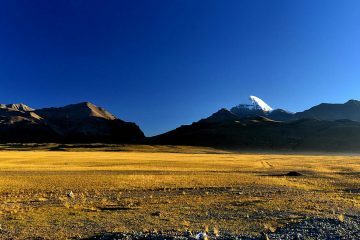 Great Tibetan landscape and sand dunes, arrive by Lake Manasarovar. Overnight at local guesthouse. Day 9: Lake Manasarovar-Darchen (50km). Chiu Monastery, prepare for trekking. Overnight in Darchen. Day 10: Mt. Kailash Kora day 1: Darchen-Dira Puk ([20 km, 5-6 hours, 5050 m]. Overnight at local guesthouse. Day 11: Mt. Kailash Kora day 2: Dira Puk-Trek to Zuthul Puk Monastery, [18Km, 6-8 hours, 4820 m]. Overnight at local guesthouse. Day 12: Mt. Kailash Kora day 3: Zuthul Puk-Darchen [14 Km, 3-4 hours, 4670 m]. Overnight in Darchen. Day 13 Darchen – Saga (500 km). Overnight in Saga. Day 14 Saga – Shigatse (450 km). Overnight in Shigatse. Day 15: Shigatse – Lhasa (280 km). Visit Tashilhunpo Monastery. Overnight in Lhasa. In 2019, Saga Dawa is celebrated on June 17th. Tour date is from June 8th to 23rd, 2019. In 2020, Saga Dawa is celebrated on June 5th. Tour date is from May 27th-June 11th, 2010. Upon arrival in Lhasa, our local Tibetan driver and Tibetan guide will bring you to your hotel. Acclimatization to high altitude: please drink more water than usual and rest well, and you will get acclimatized to the high altitude gradually. Today we visit the beautiful Potala Palace and Norbulingka Palace. Potala winter palace was built in the 17th century by the fifth Dalai Lama. It provides amazing views of the entire city and houses the private quarters of the Dalai Lama, numerous grand state rooms and chapels. Norbulingka Palace is the summer palace of the Dalai Lama, built in the 18th century by the seventh Dalai Lama. During Shoton Festival (August-September), Norbulingka has the tradition of hosting picnics in its beautiful garden and presenting Tibetan opera dance performances. Adventure starts: we drive west to reach the second largest city in Tibet. First, we cross Kampala Pass [4797m] and then Karo-la Pass [5050m], where Mt. Noijin Kangsang [7206m] glacier lies near the road. On the way, we enjoy the unreal turquoise waters of holy lake Yamdrok-Tso. 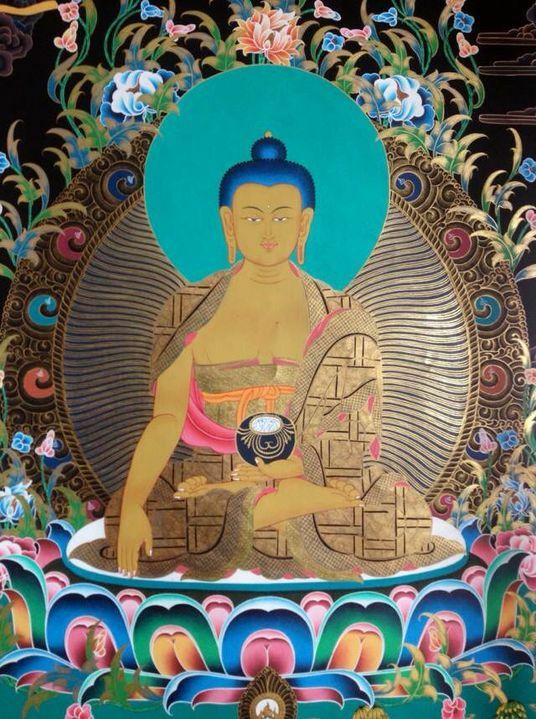 Then we stop in Gyantse, where we visit the best Tibetan art paintings in Kumbum Stupa inside Pelkhor Chode Monastery. We will also see the majestic Gyantse Dzong (fortress) overlooking the valley. Finally, we reach Shigatse before dinner. 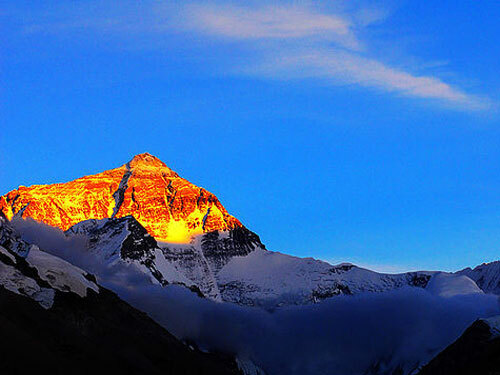 The journey to New Tingri involves crossing the high pass of Gyatso La [5220 m] and the opportunity to view Mt. Everest and the Himalayas for the first time. Before, we visit Sakya Monastery, the principal seat of Sakyapa Sect founded in 1073, one of four major Schools of Tibetan Buddhism. Its powerful abbots governed Tibet during the whole of the 13th century until they were eclipsed by the rise of the Gelugpa Sect. Its Mongolian architecture is very different from temples elsewhere in Tibet. Exciting day today: we reach one of the major highlights of our trip, Mt. Everest North Base Camp [5200m] (trekking or take bus). From New Tingri we continue driving towards Rongbuk Monastery, located at the foot of the Everest and the highest monastery in the world. We enjoy amazing views of several peaks like Makalu, Lhotse, Cho Oyu, and Mount Everest from the top of the Pang-la pass [5150m]. 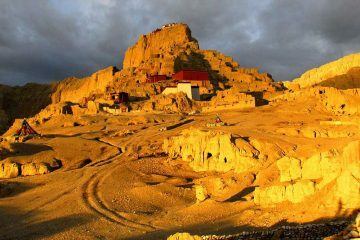 Overnight at tourist camp site located a few kilometers from Rongbuk Monastery and from where we have direct views of Mt. Everest. After spending some time at the base of Mt. Everest, we drive northwest crossing high passes with enchanting views of the surrounding Himalayan peaks like Shishapangma and the beautiful lake Peikutso. Early morning we enter in the semi-nomadic regions of Tibet’s far west. We will enjoy the authentic Tibetan landscapes during this long drive journey through the biggest and highest plateau in the world. We follow Yarlung Tsampo river west (also called Brahmaputra in India) until we reach the lake Manasarovar (Mapam Yumtso in Tibetan language), one of the three most sacred lakes in Tibet. Hindus believe that bathing in the lake water will wash off all their sins and bring good karma. Overnight at guesthouse (dorm bed with shared bathroom). Sleeping bag is recommended. In the morning, we enjoy sunrise at the beautiful holy waters of Lake Manasarovar. After visiting Chiu monastery, we drive to Darchen, at the foot Mount Kailash, where we will get ready for the upcoming pilgrimage trek. 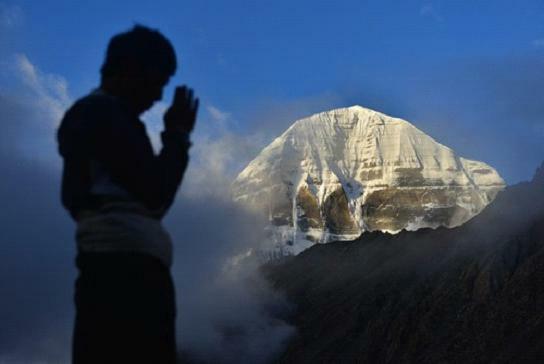 We begin the Pilgrimage Kora of Mount Kailash, the most sacred mountain in several religions. Tibetans and Hindu people from all over the world come here to pay homage. 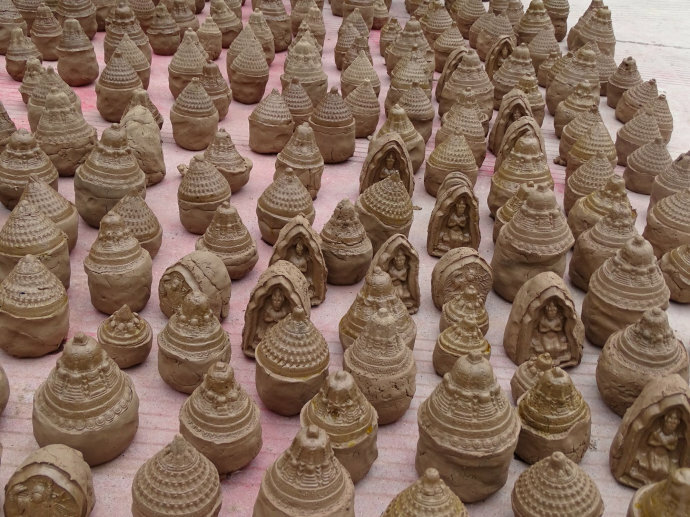 First, we go to an important pilgrimage area called Tarpoche where Saga Dawa Festival takes place every 15th day of the 4th month in the Tibetan calendar to celebrate the birth of Buddha Sakyamuni. 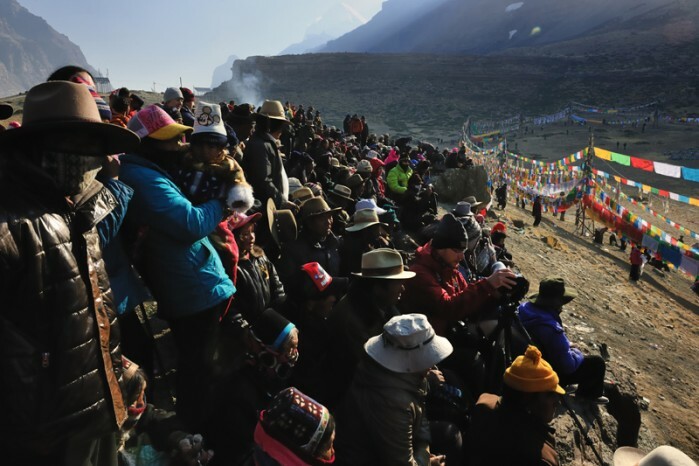 Saga Dawa is the most important festival in Tibet and for this reason we all Tibetans are willing to visit Mt. Kailash and complete its kora during this time. Today, full moon, a giant pole is raised with thousands of prayer flags (lungta) hung by crowds of pilgrims. Monks from the nearby monastery perform a special ritual during the celebration. Once the pole is raised, around midday, we start trekking around the mountain. 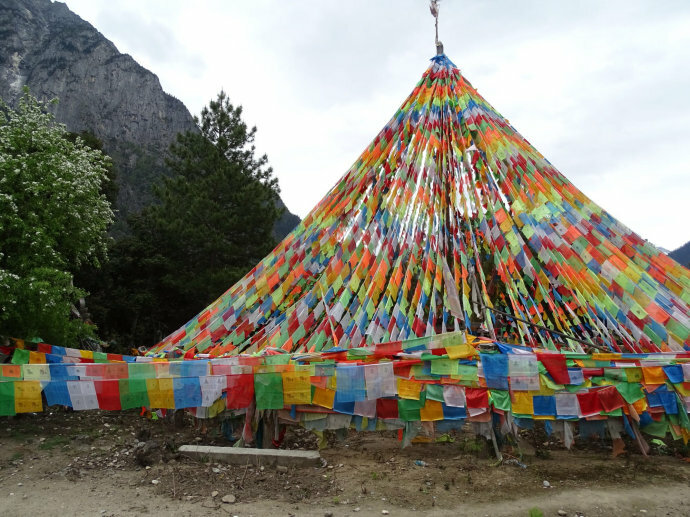 We can pay visit to the nearby Chorten Kangnyi and Sky-Burial Site Of The 84 Mahasiddhas. Coming up next is Chuku Monastery (4820m), where you can find a revered marble statue inside. 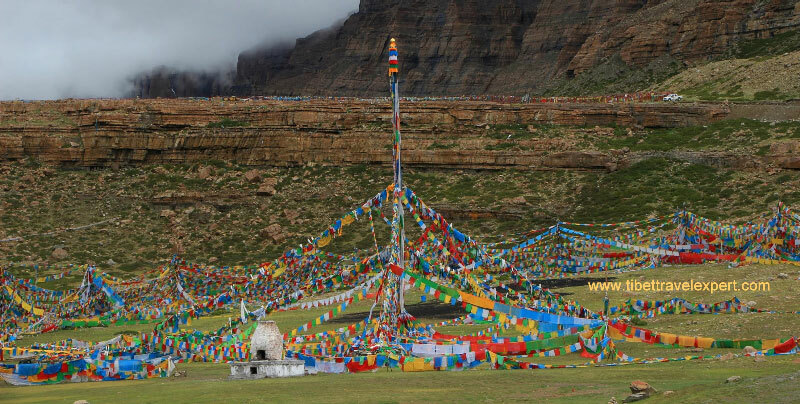 After some break time when you can take in more views, we will head towards the second prostration point, where you see prayers flags and views of the west side of Mt Kailash. The second Buddha footprint is a short distance ahead. There are several trails to reach our final destination of the day: Dira-Puk Monastery (5080m). It faces the north side of Mt. Kailash, and also provides viewpoints for peaks in other direction. Overnight stay at guesthouse (dorm bed without bathroom) near Dira-Puk Monastery. Sleeping bag is recommended. We follow the river and then climbs the Gold & Red Cliffs. Pilgrims search for holy stones on these cliff walls. We will see prayer flags across the river, and Lake Rakshas Tal in the far distance. After reaching the fourth prostration point, the final walk back to Darchen is quite easy. Overnight at Himalaya Kailash Hotel. We visit Tashilhunpo Monastery, built in the 15th century by the first Dalai Lama. Today it is the seat of the Panchen Lama. 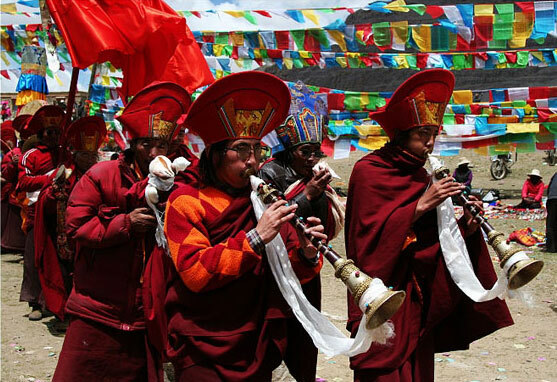 We recommend that you do the kora around Tashilhunpo Monastery. Also, you can walk around the local market. We will then return to Lhasa. Enjoy your last hours in Tibet exploring Lhasa by your own. Your guide and driver meet you at the hotel and transfer you to the airport. If the May 31 departure is not suitable for you, you can join our other departures for Kailash Everest Group Tour. Welcome to book this typical and authentic Tibetan Buddhism Festival Tour with professional Tibet tourism agency! 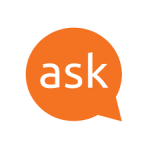 You do not have to pay US$2000 or even 2200 EURO which is sky high “Tibetan” Price. For the very similar tour itinerary and more reasonable itinerary, you will pay much less than anywhere else if you book with Tibet Travel Expert. You have every reason to save money for your other trips. Our agency only arranges pure and knowledgeable Tibetan travel guide and driver. More over, the Everest Base Camp adventure before the Kailash is not so good at all. It is better to do that after the Kailash pilgrimage. Finally you can even just book the 9 nights 10 days trip section together with Kailash EBC permit. So you have much more tour flexibility.